EDINBURG — The mood shifted in court on Wednesday when prosecutors questioned a former Comfort House employee about Monica Melissa Patterson’s behavior following the death of Martin Knell Sr., the 96-year-old man she’s accused of murdering for his money. 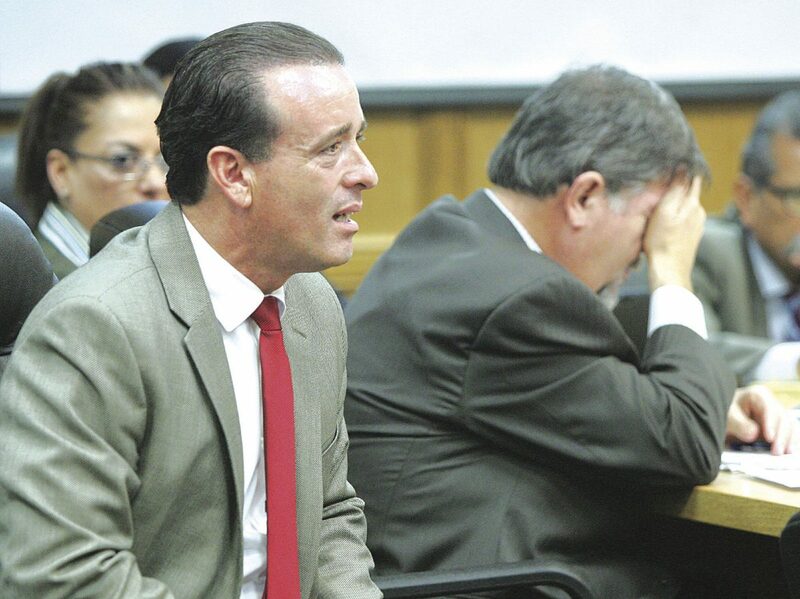 Tensions mounted between the prosecution and defense as Assistant Criminal District Attorney Joseph Orendain often objected to defense attorney Ricardo “Rick” Salinas’s questioning of Michael Merinos, the employee in question, for sidebar commentary. Merinos was hired as a caregiver at the McAllen nonprofit hospice center in 2011 and was promoted by Patterson, 50, to administrative liaison/office assistant around the time she was named administrator in 2014. He testified that he helped her run errands — not all of which were related to Comfort House — in addition to serving as a sounding board and confidant. He said it was not uncommon for them to get lunch together and for Patterson to pay, and was invited to “Cody’s party,” the high school graduation celebration Patterson is alleged to have thrown for her son using Comfort House money. 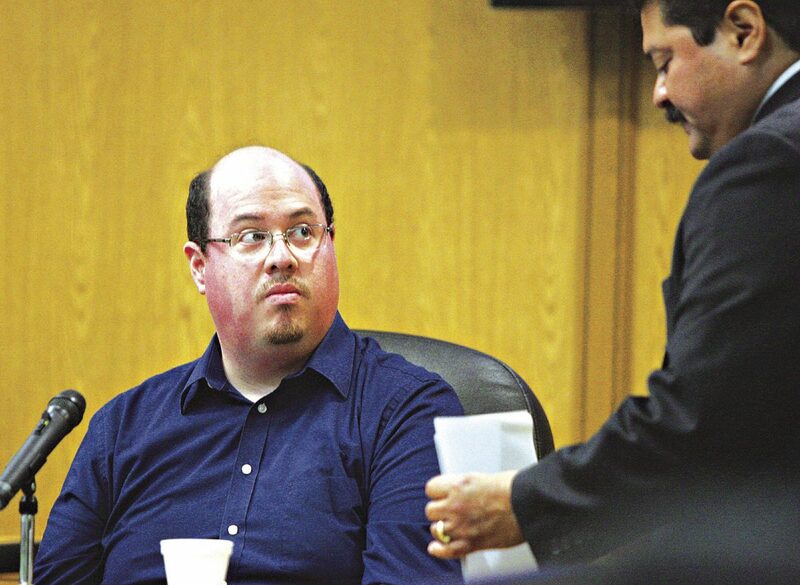 Defense attorney Rick Salinas questions witness Michael Merinos, a former Comfort House employee, during the Monica Melissa Patterson capital murder trial in the 370th District Court in Edinburg on October 4, 2017. Merinos told the jury he warned Patterson not to get involved with Knell’s finances and “day-to-day things” when she asked for his opinion. Also, Merinos said he voiced concern over her assisting with funeral arrangements for Knell’s wife, who was a patient at Comfort House. He told jurors Patterson subsequently asked what he would do in her situation since Knell had no family and had allegedly asked for her help. On one errand, Merinos said Patterson had him drive her to Texas Oncology because “she had to talk to (him), but somewhere private.” He testified that Patterson took him into a conference room where she told him about a conversation she’d had with Knell’s provider at a Weslaco Whataburger. “She told me it seemed (the provider) wanted her to confess to something,” Merinos told jurors. Patterson appeared concerned during this exchange, Merinos told jurors, and then instructed him to contact “Mario” by payphone so the call could not be traced. Angel Mario Garza — the man also facing a capital murder for remuneration charge in Knell’s death — became involved with Comfort House when his father was a patient there and frequently performed odd jobs around the facility. After they failed to find a functional payphone, Merinos testified that he contacted Garza, 39, himself using his cell phone and drove Patterson to meet Garza. This is when Patterson is alleged to have told Garza “that the cops were looking for him in regards to the old man” and warned him to hide. Merinos said Patterson later explained this exchange to him as having to do with Garza’s immigration status. Throughout his testimony, Merinos became visibly flustered, something that Salinas pointed out on multiple occasions, asking Merinos why he was turning red. At other points, Salinas questioned Merinos about giving answers to please the jury, to which Merinos stated that, while he did not want to be on the witness stand, he was there to tell the truth. Salinas asked Merinos if — after meeting with the District Attorney’s Office and the Texas Rangers, one of the agencies investigating the charges against Patterson — he “felt that (he was) a target of the investigation.” Salinas also asked Merinos if he felt like he needed a lawyer after these interviews. Merinos answered no to both questions. Salinas then questioned Merinos about giving conflicting statements to various investigators in 2015 and 2017 — the former relating to a probate court case involving Knell’s will, of which Patterson became a beneficiary in fall 2014. Heriberto Suarez, a former San Juan city commissioner who Merinos said was part of Patterson’s graduating class, was mentioned during Wednesday’s testimony. Merinos testified that after Patterson was hired as administrator, Suarez was paid to mow the lawn and do other jobs and tasks previously assigned to volunteers. Earlier in the day, the victim’s son, Martin Knell Jr., returned to the stand for his cross-examination by the defense, which was relatively short. The defense may elect to call Knell Jr. back to the stand at a later date. The prosecution will continue to lay out their case against Patterson Thursday when witness testimony resumes.